You can keep your climate change bill and all the extra costs associated with it. Yeah, yeah, yeah. I know. The climate's changing and it's a calamity. Well, count me as a skeptic. I'm not really a climate change skeptic, but I am a skeptic that it will be a calamity. I'm skeptical that getting rid of cars, planes, cows, washing machines, etc. is actually going to be for our betterment. The climate has always changed. People adapt. That's what we - the human race - have always done. Back when Newgrange was built in County Meath - 5,000 years ago - Ireland was warmer than it is today. The average Irish person today is pretty fair-skinned, but if we have to endure summer temperatures in the 80s as 'we' did when Newgrange was built, we'll adapt. Same goes if we get colder winters. I'm a lot more worried about the price of gasoline (petrol) in Ireland today than I am about what the climate will be 2111. You want to say I'm selfish or stupid, I don't care. I'll adapt to your hot temper or cold stare too. As you know, gas prices have been climbing steadily. I was in America for a 12 days after Christmas. I paid around $3.25 per gallon in upstate New York, which is by no means cheap. 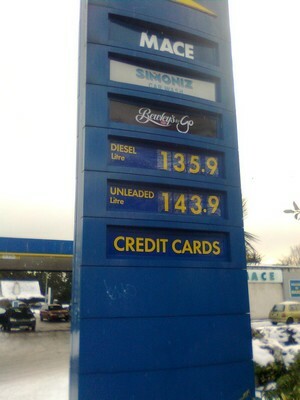 However, it doesn't come close to the price we're paying for gas here in Ireland. At the current exchange rate a gallon of gas here is around $7.25 (€1.44/l). That's up from around $4.93 per gallon (€0.98/l) on this date two years ago. Obviously, a big chunk of that increase is due to the huge rise in oil prices over that period. However, in Ireland only about a third of the price of a gallon of gas is accounted for by the price of oil. The rest is tax, and the taxes the Irish government levies on gasoline have also been rising steadily. Over the past 18 months the government has added 18c in tax to the price of each liter of gasoline. That's nearly an extra $1 per gallon in taxes. There would be uproar in America if the government imposed such a tax on a gallon of gas at a time of skyrocketing oil prices. Here, however, drivers have simply taken it because we're all aware that the government is bankrupt and taxes are rapidly being raised to try to close the budget gap. Nobody's happy about it, but we're grumbling and putting up with it. That doesn't apply to the government's proposed climate change bill, however. This is a pet project of the government's minority party, the Greens. Not only is the government going to propose meeting the EU's ridiculous carbon emissions targets, but thanks to the Green Party's influence we're going to have the tightest emissions goals in the EU. We'll go far beyond what the EU demands of us! You don't have to be a genius to work out that this is going to mean more tax on gas. A lot more tax. Money taken out of the pockets of Irish drivers to provide essentially zero benefit to anyone in Ireland. It should never happen - especially in the current climate.